Ideal for stonemasons to lift large stones in place. Inserted into a prepared hole directly above its centre of mass. It works by applying principles of the lever and utilises the weight of the stone. 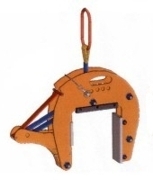 The WIMAG Stele and Block clamps are suitable for lifting a range of products. Flat Clamp FZ 0.8 - suitable for tightly positioned blocks. 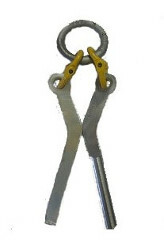 Flat Grab FGS 1.5-30 - suitable for handling rough stones and concrete parts with parallel surfaces. 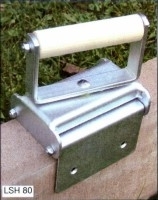 The ideal lifter for border stones according to DIN 483.